People sit around and sigh, saying there isn't enough to do here anymore. Well actually, there is plenty of things to get to around our region and I'm going to point the way. 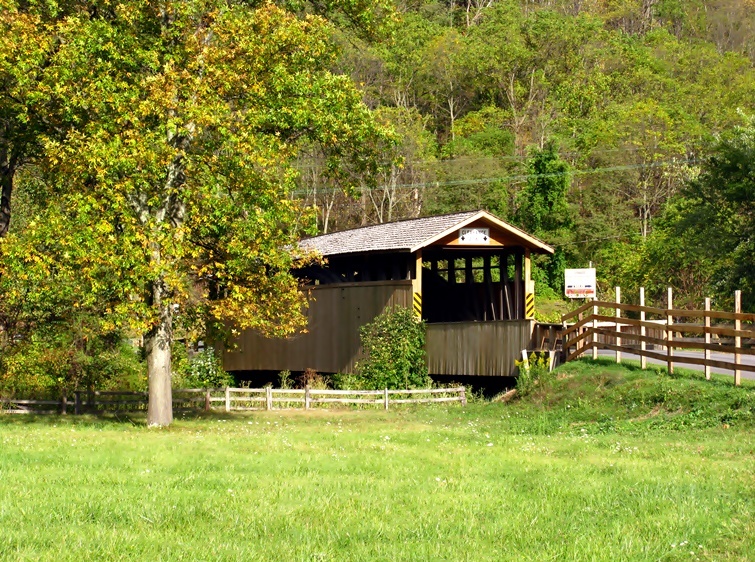 Here's a brief rundown on some of the exciting festivities going on this fall, beginning with Westmoreland County and moving on to Fayette and whatever others are to be included. A brief note about The Scottdale Fall Foliage Festival. This took place just last weekend, so I'll pass on giving details at this time around. This pertains to most of the festivals from earlier in September, or are already well underway. Secondly, Fort Ligonier Days with its frontier reconstructions, many band venues, exciting reenactments and artillery demonstrations among other loaded attractions in a 3 day extravaganza from Oct. 9th through the 11th, is going to be covered in a prominent article in the very near future. For this very reason, 'Fayette/Westmoreland Forgotten History' will forego involved descriptions, except to give a few hints, starting with state parking for the 'Loyalhanna Post' is only allowed at the High School and the Laurel Valley Golf Club on Rt. 711 south and please try to arrange your visit to experience the reenactments with the Indian war whoops and the blasts of muskets and cannon of the November skirmish on the afternoons of the 10th and the 11th! The Bedford Fall Foliage Festival, which has arts, crafts, food, (with over 400 booths), and of course, entertainment, kicks off on Octobet 3-4, and continues on the 10th-11th. You can call 1-814-624-311 for more information. Directions are 2 miles from the PA Turnpike exit 146 on Business Route 30, alright? The Compass Inn in the Ligonier Valley at Laughlintown: Three miles east of Ligonier on Route 30 is where you'll find the anciet site. According to http://www.compassinn.com/, the Compass Inn was a stage coach stop from 1799, and will give all an informative and entertaining tour. Popular until the railroad days, the historic place was purchased by Robert Armor in 1814 and then given its proper name. Now it has been restored and refurnished with fascinating period furniture and is owned by the Ligonier Valley Historical Society. This is a pretty intensive tour and with all the old bedrooms, cookhouse and blacksmith's shop and outbuildings, and would be a great way to spend the day. They even have a Conestoga wagon! Check out their concerts and field trips as well. Don't forget the Halloween Hauntings of the 30th and 31st to give some spine tingling thrills! Bushy Run Battlefield: It all began on August 5, 1783 and you do know how it ended, don't you? I have more of the story at this link: 'Turning Tides At Bushy Run'. This very historically important location experienced their 250th Anniversary in 2013. Check out their site for tickets and further information. You can also book group tours. Maybe give in and 'buy a brick' for the upcoming planned monument from the Edgehill Gift Shop! There will be 3 granite and 3 bronze statues and monuments representing the American, British and Native Indian forces that were deeply involved in the battle fought here. There is a Nature Walk on Saturday at 10 a. m. on September 26, so maybe you want to keep this in mind for 2016. Sewickley will be having their Octoberfest all day in the month of, you guessed it!, October! This will be on the weekend of the 2nd and 3rd. There is an admission charge of $10. More can be read about it HERE. Somerset had the Laurel Arts Somerfest July 17-19 on 214 South Harrison Avenue. 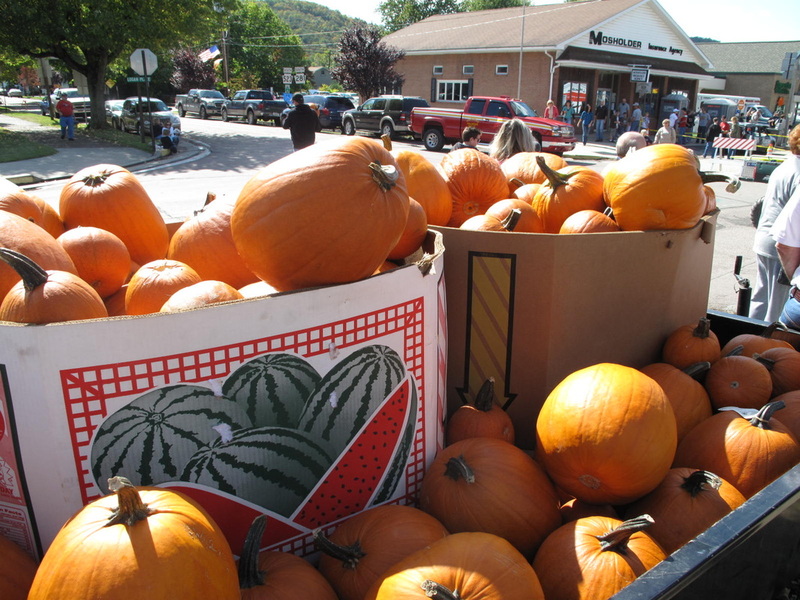 Connellsville: The Autumn Mum Festival on the first Saturday of September. Did you miss this one? Well...catch it next year! There's the PumpkinFest at Confluence, PA Friday thru Sunday, October 2nd-4th. They'll be judging the largest pumpkin, parades, Pie Eating contests, the Rod Classic Auto Show and I wouldn't dare forget to mention the Great Pumpkin Race! This sounds like a good one to check out, and if this isn't enough to get you interested, there is the Car Smash. Cool! I would recommend the festival for sure and, if time permits, really would like to get on down there. Bullskin Township has the Heritage Days Festival: This is at the Mount Vernon Furnace Grounds on 484 Park Road off of Rt. 982 and takes place on Oct. 17 and 18th from 8:00 a. m. to 5:00 p. m. and 2015 will be the 19th annual event. The historic furnace, once owned by Isac Meason, the Iron Monger, is steadily being upgraded to better reflect what is believed to be the original appearance. Quite a task. This is a nice homey, yet sometimes fascinating festival to go to. It tends more toward a colonial theme with arts and historic talks and a whole lot more. Parking is free at the nearby township fairgrounds. Pike Days- Brownsville at Nemacolin Castle with ghost tours in mid-May is something to check out mostly toward spring. 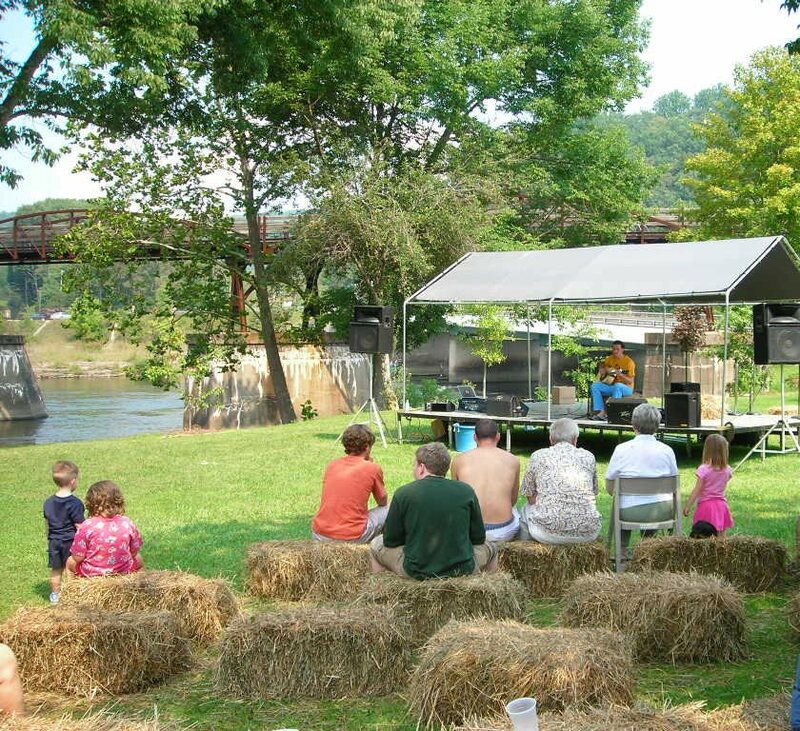 The Laurel Hill Bluegrass Festival: of August 16 and 17 was said to of been a lot of fun. A fairly new festival from 2008...from Laurel Hill State Park and the Friends of Laurel Hill. This might be as good of a place as any for me to state once and for all, I don't have any plans for the blog to become a travelogue of sorts. Nothing to worry about there. Still, during this season of cooler temperatures amid amazing vistas of historic import and special beauty, many other happenings are taking place all over the surrounding communities worth your consideration to head out to see for yourselves. Check listings online and at sites below. You will likely discover exactly what you are looking for to join in the magnificent celebrations and many other places, like Nemacolin Woodlands, the various wineries and hiking spots. That might well include hotel or camping accommodations, and parking and choosing picnic areas. Find a special nook and pass it on! Event Crazy has a nice site for checking further into the many local and national festivities by month and date. You may want to give it a go. 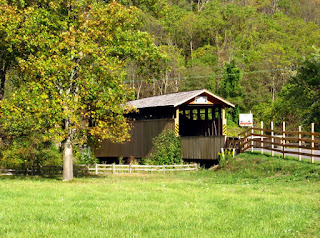 One of the best websites I know of is Laurelhighlands.org. Take a peek at their Map Explorer too. You'll find it helpful. The time is NOW, the wonders of Fayette and Westmoreland counties and our Southwestern Pennsylvania region are waiting for your attention and are out there to enjoy. Trust me folks! So take a break and pack up the car and gather the kids for some adventure and make a little history of your own. Did I miss any important festivals that are family favorites or YOU are really partial to? Please leave a comment and tell me more about it. If they are as interesting as you feel, they can be always be added later. Just maybe, I will get to see and meet you at one of the festivals, you never know!